Order any of our licenses today and receive following 3 gifts worth over US$ 500 (including shipping). 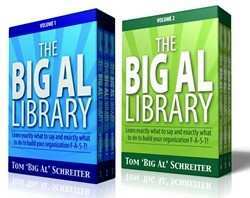 Get Tom “BIG AL” Schreiter’s special library packs 1 & 2 worth US$ 294 for free. This library contains 36 CDs and full of great tips on growing your network marketing business. One of the most popular MLM training/coaching courses available today. Great listen for you, your staff as well as your network marketers. Gift will be delivered to your door steps. This gift is not available for Aspire License. Get MP3 digital download of Total Success Pack from Michael S. Clouse worth US$ 97. Designed to teach almost anyone how to build a successful Network Marketing business, this complete step-by-step program comes with everything you need to shorten your learning curve by six- to eighteen-months! Knowing exactly what to do saves you valuable time and money! You will be provided download instructions to download the files. Click here for more details. 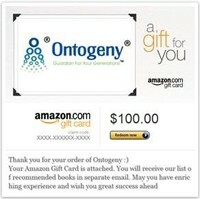 Amazon Gift Card worth US$100 along with our list of recommendations for books, audio CDs worth considering for growing your network marketing business. You will receive your Gift Card details in your email.